Paperback (large format), 128 pp. 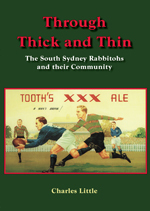 Through Thick and Thin explores the links between the club and its supporters and the meanings of sport in South Sydney in that the Rabbitohs represented the pinnacle of a vibrant sporting culture in this district. The book provides a wealth of fascinating detail about the everyday lives and experiences of the people of South Sydney. It explores the involvement of both men and women, Aborigines and migrant communities suggesting that sport in South Sydney provided the opportunities for the formation of multiple identities. Charles Little is a senior lecturer in Sports Management in the London Metropolitan Business School at London Metropolitan University, where he teaches the socio-cultural aspects of sport. He completed his PhD at the University of New South Wales in 2001, and Through Thick and Thin is a revised version of his dissertation. This research saw him recognised by the Australian Society for Sports History as the inaugural recipient of the Tom Brock Scholarship. Aside from his academic interest in rugby league, he has published articles in a wide range of international journals on topics including the politics of international sporting contacts with Rhodesia, sport in South East Asia, and the politics and economics of the Olympic movement.